One potential hurdle, however, is the political climate in the state, and especially in that district, which went heavily for Republican Scott Brown in last month’s Senate election. If Kennedy were to run and win his party’s nomination, he could risk become a lightning rod for the newly energized conservatives from around the country who poured millions of dollars into Brown’s coffers. I can't take all this drama. Update: I dispute Jules Crittenden's observation that "No Kennedy chompers in that grin, too bad." This guy looks the part. He's plenty toothy, and grinny. 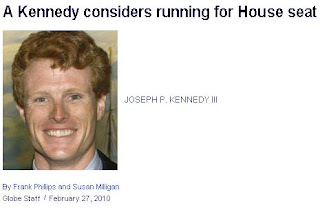 --- Whoops, misread JC's post, he was referring to Martha Coakley's lack of a Kennedy grin; agreed. Update 2-28-2010: It's over(?) - Joe Kennedy III Not Running for Congress. He looks a little bit like Conan O'Brian. Maybe Conan used his $45 million severance package for a little plastic surgery and a new career? A Kennedy running for office in Massachusetts? Why, summon a medic for I fear I shall swoon from the shock. Count the Kennedy's along the legions of the undead along with ObamaCare. That's a relief. With his dad out of politics, America hasn't had a friend of Hugo Chavez to go to in securing subsidized oil for America's suburban poor. This should save the Citgo sign behind Fenway Park. We've lost enough national monuments as it is. I wonder if MA are sick enough of the Kennedys to ignore this attempt. I'll bet this nobleman, young Lord Boston, spends more time on his hair than even Sir John Edwards, Keeper of the Castle of the Carolinas. Any takers? Why won't they just GO AWAY!?!?! The Kennedys are like the slasher in those horror movies. Just when you think you've killed the guy, he comes alive again to make your life hell and to shed more blood. Why won't these Kennedys go away? What makes them think we want them telling us what to do? Sheesh! Man, take your giant sized choppers and eat poop and die! Just go away!